During WWII the Willow Run Bomber Plant located near Ypsilanti, Michigan was the largest factory under one roof in the world. Some 40,000 employees, mostly women, turned out B-24 Bombers at the rate of one every 55 minutes. Willow Run follows the journey of four of those women who migrated from all over America to find new lives at the plant. Along the way they overcome a multitude of challenges, learn to endure new sorrows, overcome deep-seated prejudices and forge new friendships. Winner of the 2017 Edgerton Foundation New Play Award. Original music by Ben and Jeff Daniels. Directed by Guy Sanville. The show runs through September 1, and tickets for show are on sale now. Need a good laugh about Washington? 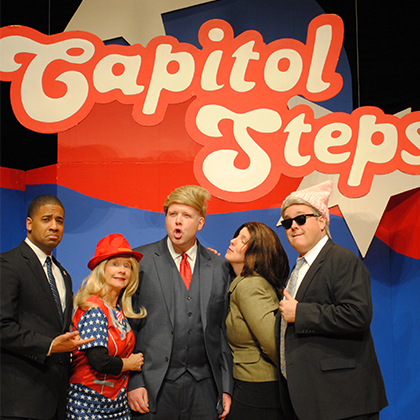 Michigan Radio is pleased to welcome The Capitol Steps back to Ann Arbor Summer Festival for their annual 4th of July show!